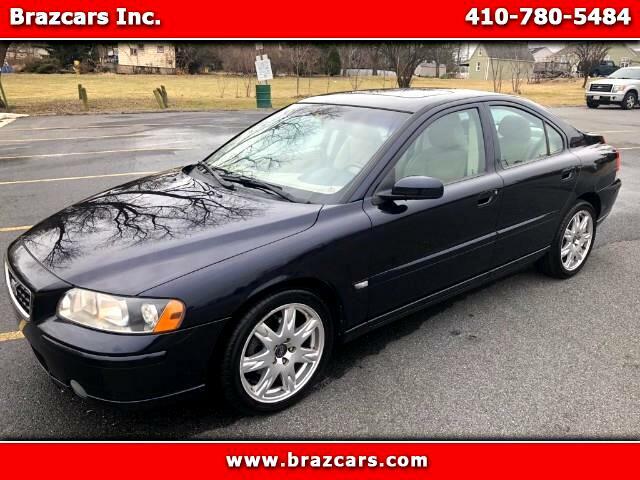 Used 2005 Volvo S60 2.5T for Sale in Rosedale MD 21237 Brazcars Inc. The S60 was built on Volvo's P2 platform,which was shared with other Volvo models like the S80, V70, XC70 and finally the XC90. The Volvo S60 was released in 2000 (2001 model year) being the company's new generation sports sedan. The S60 is aimed to mainly compete with the BMW 3 Series (E46) and the Mercedes-Benz C-Class (W203). Unlike its rivals, the Volvo S60 continued production for 9 years with multiple facelifts. The S60 was refreshed in 2005. The exterior was updated with body-colored side moldings and bumpers with chrome linings, as well as new headlamps replacing the original with black housing. The interior received some updates as well, with new seats, trim, and an updated center console. The S60 went through a final facelift in 2008 with full body-colored bumper and door inserts and larger emblem in the front and larger spaced out "V-O-L-V-O" letters in the rear. The interior featured a new pattern upholstery which differs from its original pattern. The S60 came standard with Volvo's own radio unit, the HU-650 and an optional extra HU-850 unit. The HU-850 unit features a 225 or 335-watt power output (depending on optional external amplifier) with three presets: 2CH, 3CH and Dolby Digital Pro Logic II Surround Sound. The Four-C chassis from the S60 R became an option on some S60s. In 2005 the T5 engine was reengineered from 2.3 to 2.4 litres and received an increase of 10 bhp (7 kW; 10 PS), and a modified turbo in the D5 model also increased the D5 bhp from 163 bhp to 183 bhp..
We do BHPH (in house) and bank finance.